Through the interplay of tradition, the unique climate and soil conditions in Styria and a little time, the Styrian pumpkin oil is a national speciality, causing more and more international attention: the original Styrian pumpkin seed oil. 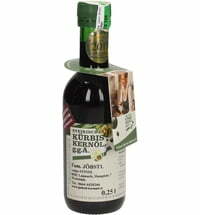 Original Styrian pumpkin seed oil is today the figurehead of Styrian culinary art - and rightly so, because the unique dark green, nut-smelling and intense-tasting oil is an absolute treat. The pumpkin is one of the oldest cultivated plants in the world. The oldest finds were made in Mexico and are around 12,000 years old. Let's make a big leap in time now. The first preserved, written reference to the fact that pumpkins are grown in Styria dates back to 1697. Subsequently, the pumpkin seed oil (which was then still white) has been used for salves as well as by the military for axle grease. At that time, oil was pressed with pumpkin seeds, which had a shell. Today's pumpkin seed oil developed from the year 1880 when farmers first discovered a soft-shelled mutation of the pumpkin. This variety was subsequently grown more and more and finally, the Styrians bred the shell-free Styrian pumpkin seed. Until the First World War, the oil needed laborious pressing and was only for self-sufficiency. Over time, the growing area of this pumpkin variety continued to expand, which is why in 1996 a protection of origin was issued by the EU. This means that only pumpkin seeds from the protected area are pressed into original "Styrian pumpkin seed oil PGI"; the pressing may also only come from Styria. The incomparable taste of the Styrian pumpkin seed oil is significantly influenced by the climate conditions of southern Styria. There are sandy, well-ventilated loamy soil and a special microclimate for excellent quality. In autumn, the temperatures are mild due to the influence of the Adriatic Sea. Southern Styria is also extremely sunny. Harvesting is still done by hand to a large extent, larger companies also use machines. Thereafter, the kernels must be peeled from the pulp. This process, known as "hacking", is still done exclusively by hand. The kernels are finally washed and dried. Then it goes to the mills, where they are ground. The ground kernels are mixed with water to form a pulp, which is then roasted with constant stirring. This creates the typical roasted aromas and the nutty taste of the oil. The roasted pulp is finally squeezed. The original Styrian pumpkin seed oil uses neither foreign oils nor are preservatives or other additives allowed. The oil, which is extracted from the shell-less Styrian pumpkin seed, is dark green, natural, tastes deliciously nutty and is also healthy with its high content of unsaturated fatty acids. It refines creamy soups and salads and goes well with cheese, as this combination brings out the unique flavours of the oil. 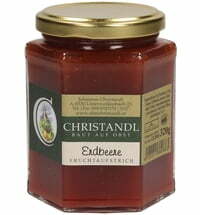 In the GenussRegion shop we have many different pumpspecialitiesties from Styria. From the classic oils, to snack pumpkin seeds and exquisite pestos. Here you will find our selection. Mix 2 teaspoons of sour cream per serving with some pumpkin seed oil and half a teaspoon of chopped dill. Peel the raw potatoes and finely grate them with a grater. Then squeeze it well. Now make palm-sized, thin pancakes from the potatoes. Take a flat cake and cover it with a slice of smoked salmon. Then cover the salmon with a second flatbread. Salt a little and then fry in a hot pan with a little oil and butter (mix both) on both sides until they become a golden yellow colour. Serve with green salad and serve the cream pumpkin seed oil sauce warm. Enjoy!